I’m partial to Italian wine, and whilst I’ll usually plump for an Italian red, there are some good whites. There’s some bad ones too, but let’s not worry too much about those. There’s plenty of Pinot Grigio sloshing about at all sorts of quality levels, but the regionally specific wines tend to be a little more, well, Italian. Soave has had some drama over the last couple of decades, with the boundaries being redrawn, perhaps diluting the quality levels at the Classico level and upsetting plenty of producers, some of whom are simply not playing any more and are putting out their wines to stand on their own, bypassing the controls that would normally guarantee quality but that they feel are damaging it. No such worries with a Waitrose wine though. As a supermarket own brand label you’re unlikely to get the finest example, but this is Waitrose after all, the supermarket that carries Brioche and Ironing Water in its “Essentials” range, rather redefining what people think of as being “essential”. The label is quite plain with a cheery Vespa on the front, giving you the impression of Italian fun. I do like sitting outside on summer evenings in Italian cities, drinking wine, eating pasta and watching Italian youths being cool whilst riding scooters. They do it so well. 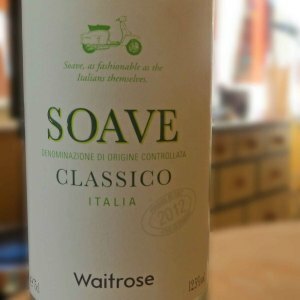 This Waitrose Soave Classico is a pale straw colour, it smells fresh and young with a zippy peach aroma. It’s dry with a balanced, mineral acidity. It’s medium bodied with a medium alcohol level. The peach flavour comes through, along with some bitter peach stone flavour that’s aiming at almons. I’ve never quite understood how the flavour of peach stones, almonds and cherries are all different, but they have some sort of common thread, and this wine has that common thread. If there were such a thing as white cherries, this is likely what they would taste of. The mineral flavour carries through to the end which keeps it sharp. It’s best served quite cold. Waitrose will sell this wine for £8, but watch out for it on sale or as part of a mixed case as I’ve paid £6.50 for it which is a good deal.